Last summer, two Oxford Area High School students participated in the Rotary International Short-Stay Youth Exchange Program, which allows students to experience daily life in another country without the year-long commitment and cost of Rotary’s traditional exchange program. 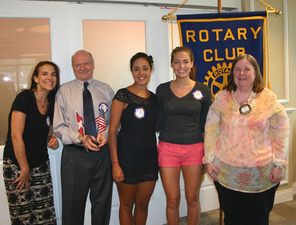 The students’ month-long participation in the Short-Stay Exchange was sponsored by the Rotary Club of Oxford. Oxford Area High School senior Hannah DalPorto traveled to Upper Austria, where she lived with the Huber Family in the village of Ried im Innkreis. During her stay, Hannah traveled extensively with the Hubers, including trips to Salzburg and Vienna. As part of the exchange program, Kathi Huber accompanied Hannah on her return trip to Oxford, where she stayed with the DalPorto family and visited several sites in the area. From left are Rotary District 7450 Governor Doug Blazey, Hannah, Kathi and Oxford Rotary Club President Marilyn Knaub, M.D. Oxford Area High School senior Elyza Higgins traveled to Northern Spain, where she lived with the Jose Family in the village of Entrialgo in the Asturias province. As part of the exchange program, Maria Jose accompanied Elyza on her return trip to Oxford, where she stayed with the Higgins family. Pictured from left are Elyza’s mom Constance; Albert Lauber of Neuchatel Swiss Chocolates, where Elyza works after school; Maria, Elyza and Oxford Rotary Club President Marilyn Knaub, M.D.